CLICK HERE for our 2019 HHW Collection Schedule! 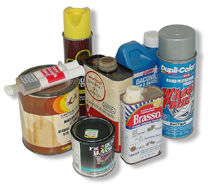 The Regional Planning Commission recognizes the great benefit to keeping toxic chemicals out of our water supplies by providing management options for unwanted chemicals like cleaning products, paint and paint related products, automotive fluids, and much more. 2015 was the last year we collected medicines with DHMC at our HHW collection as there are many other options every day at police stations around the region. Visit www.twinstatesafemeds.org for a list of locations and other information about keeping your family safe with proper storage and disposal of medicines. WHY buy toxic products in the first place? Sometimes there is an equal or better nontoxic alternative. Check out our two new comic books. Visit the Educational Resources page to download them and have a look at our new virtual tours of a school, home, and grocery store. People try the Nontoxic Cleaners and LIKE them! My dog has gotten sick in the past from licking floor cleaners off the floor so a mix of only vinegar and water is great. Thank you for doing this work! It is so important and we need to continue to rally together to make a change! I’m gonna annoy all the people in my dorm this year about what you told me at the farmer’s market. Scary stuff, but I’m glad you are teaching people. Thanks!